In the unlikely event that a limited strike on the Syrian government through air strikes, rocket attacks or artillery shells has no other effect on the religious war, then we doubt that the impact of such a strike will send shock waves throughout the Middle East. But, such a strike would weaken the government’s heavy weapons capacities, and so even the battlefield for the Sunni rebels against the Shi’ite government and increase the ferocity and sectarian nature of the war. At some point (as with that first gunshot that started the First World War) sectarian ferocity would infect other nations and bring new destructive tactics to the war on a regional basis. 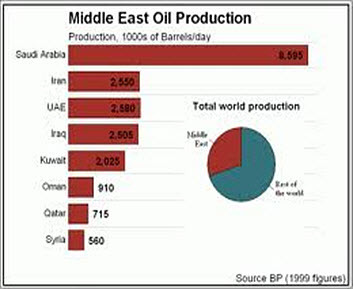 Would Shi’ites turn on the oilfields in their area, such as in Saudi Arabia and other West Persian Gulf States and damage production? That alone would send the oil price over $150 or higher as supplies became interrupted and vulnerable. The speed with which Kuwaiti oilfields were repaired gives us a time perspective on how long successful repairs to interrupted oil fields would take. But that would not remove the Shi’ite workers from those regions. The implications are that Saudi as well as U.S.[?] troops would be used to guard those fields, quickly. Would Iran be emboldened to interfere with the oil passing through the Straits of Hormuz? This seems unlikely for while it is the jugular of Middle Eastern oil, the U.S. has placed its navy so as to prevent that from happening. Nevertheless threats of such action would warrant nations stocking up their oil supplies, taking prices even higher. Because of the ongoing risks, would global financial markets keep oil prices high until the conflict were over? We think that prices over $150+ a barrel, would deeply impact global economic growth and inflation, affecting nearly all people on earth. This alone would be a game-changer for all financial markets. Not only that, the average person worldwide would become emotionally involved in the conflict. This would lead to a considerable deepening of the consequences of the battle that would place the world of Islam against commerce and politics. It may well be that the United Nations would be given considerably more power to deal with this in that event? We now turn from the individual’s reaction to an oil price over $150—over $200?—to government’s reactions to getting and paying for the oil it needs. At such prices, national foreign exchange reserves—with which to import oil—would diminish quickly. As a result, importing nations would suffer rising trade deficits. It would become critically and strategically important to keep the oil price down around $100, or see the global economy falter and buckle. China with its $3.5 trillion in reserves would be better placed than all other nations except the U.S. (who can still ‘print’ dollars) to weather such a storm. For them the issue would reduce simply to the quantity of supplies it could get to go forward with. The increase in local supplies from ‘fracking’ would certainly help in this regard. Securing sufficient oil supplies to fuel other economies would become a nightmare, leading to potential rationing in such nations, as well as to further decays in trade deficits as their economies faltered. Consequently, exchange rates would be decimated against the USD, which would certainly remain the currency in which oil would be paid for (except Russia and the nations ruled by Shi’ites, a much smaller quantity) worldwide. In such an escalation everyone will be involved with the issues in one way or the other. If this scene were to happen, then the credibility of most currencies would be at stake. Such a scene would qualify as ‘extreme times’ in which gold becomes money. When the ‘carry trade’ in the developed world’s banks invested in the emerging world, those nations built up their reserves with such ‘hot money’ and as it now departs, those countries allow their exchange rates to fall, building up international competitiveness as well as preparing for the next set of currency crises. They have not depleted these new found reserves. While these will serve under such conditions, they will need to be augmented to cope with the crisis longer term. But under these conditions, those reserves would dwindle quickly. 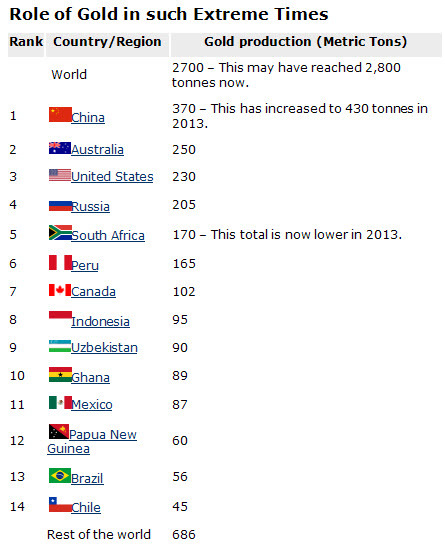 More importantly the creditworthiness of non-oil producing nations, in the eyes of oil suppliers, would drop fast. It’s doubtful that an oil supplier would risk his scarce supplies if he doubted the ability of a buyer to source USDs. It may be that most oil suppliers would be prepared to accept the Chinese Yuan then. But oil suppliers would want payment in a more reliable manner. That’s where nationally-owned gold would come in. A nation’s gold reserves is usually stored ‘unallocated’ in the Federal Reserve in the U.S., or the Bank of England in London, or in the Banque de France in Paris. It would be a safe way for an oil supplier to ask for that gold to be pledged against a bill for oil on the oil-buying nation. At that point, national gold reserves would become vital in the continuation of oil supplies and would probably act as collateral for dollar loans/Yuan with which to buy oil. And as such, the need to increase the national reserves of gold would become critical! With the present world stability upended by such a war and its ripple effects, uncertainty would rule. The world would be shaken in a way not seen since World War 2. At such times, gold would become a strategic asset. It would be considered by governments to be in the national interests to secure as much as possible. With gold supplies from mining being so inflexible and limited to around 2,800 tonnes a year, the only other source of gold would be gold sold into the market from current holders. To persuade them to sell under such unstable market conditions (for paper currencies) gold prices would rise to prices way above those even contemplated. Even then we doubt that governments would be able to buy enough gold. At such times we would not see just a few emerging nations buying gold, but a considerable number of them. The market would become disorderly but uncontrollable. No government would be able to control it. No nation would be able to allow that. They would not tolerate a host of private buyers and speculators playing around with the price. They would want a clear run at all available supply. But the competition from other governments in the market would be overwhelming. Other tactics would be brought to bear when government competes with government! For nations already producing gold, the answer would be simple. As China, the world’s biggest gold producer, and Kazakhstan are already doing, the immediate source of gold would be from their local mines. All local production would be diverted to the national reserves kept within their borders. Other nations would do likewise with any available locally-owned gold, in the interests of national security. What would this do to the supplies of gold to the international markets in London and elsewhere? They would dry up. It would be unlikely that there would be a private market for gold. With gold such a strategically important asset and money, only one further source of gold would exist—their own people! Hold your gold in such a way that governments and banks can’t seize it!